It is more than often forgotten that the justice reform that is currently implemented in Albania is an experiment. Never before in European history has a reform of the judiciary been so far-reaching. As I have written before, a 2011 report from the Romanian Center for European Policies, “EU Approach to Justice Reform in Southeastern and Eastern Europe,” gives a sobering account of the anti-corruption measures and judicial reforms previously supported by the EU in Eastern Europe. There is no proof that the justice reform as implemented in Albania will actually deliver the desired result: an independent, strong, and non-corrupt judiciary. The justice reform in Albania comprises two main components: the reassessment of the entire judiciary branch by a series of vetting institutions elected by the Albanian Parliament and the establishment of a series of new judiciary institutions: the High Judiciary Council (KLGj), the High Prosecutorial Council (KLP), the Justice Appointments Council (KED), and the High Judicial Inspectorate (ILD). All of the candidates for these new institutions from the judiciary branch will have to be vetted. One of these morbid symptoms has been that because of the absence of the KLP, a Temporary Prosecutor General was elected by the Socialist majority in violation of both letter and spirit of the Constitution, on the basis of a very dubious “legal opinion” written by EU and US bureaucrats. As long as there is no KLP, there will be no new General Prosecutor, and the Prosecution Office will be essentially under political control of the Rama government. Another morbid symptom is that the Constitutional Court has now dropped below its quorum, to 5 and very soon possibly 4 members. As a result, it will be unable to take any decisions. According to the Constitution, the 9 members of the Constitutional Court are elected by the President (3), Parliament (3), and the High Court (3). In all cases, the KED ranks possible candidates. So no KED means no Constitutional Court. The same situation is found in the High Court, where only 4 out of 9 judges are left. As a result, the High Court has a backlog of nearly 24,000 cases. This means that we are now entering the territory where the Constitutional right to a “fair and public trial, within a reasonable time” (art. 42(2)) will be violated on a permanent basis, opening the perspective of a wave of such cases at the European Court of Human Rights (ECtHR), possibly leading to millions of euros in damages to the Albanian State. High Court judges are appointed by the President at the proposal of the KLGj. No KLGj means no functional High Court. Currently, a total of 48 candidates for the KLP, KLGj, KED, and ILD have to be vetted. So far, 3 of them have been vetted and all failed to pass: Besnik Imeraj (KED candidate) resigned, whereas Besa Nikëhasani (KLP candidate) and Besim Trezhnjeva (KLGj candidate) were dismissed by the Independent Qualification Commission (KPK). As I have argued before, it seems unlikely that any of these institutions will be installed before the summer, or even this year. This means at least a year without legal General Prosecutor, a year without functional Constitutional Court, and a year in which the backlog at the High Court will continue to grow. Meanwhile, as the vetting will arrive at reassessing legal aides, the prosecution and courts will be crippled by ever more vacancies. It is far from guaranteed that there will be enough candidates confirmed by the vetting institutions to fill in all the positions in the new justice institutions, which would mean yet another open call for applications, another round of candidate vetting, and so on. But let us assume that eventually all candidates are vetted and the KLP, KLGj, KED, and ILD can assume their constitutionally mandated functions. Whom will they appoint the massive number of vacancies the vetting is bound to leave in the prosecution and courts? 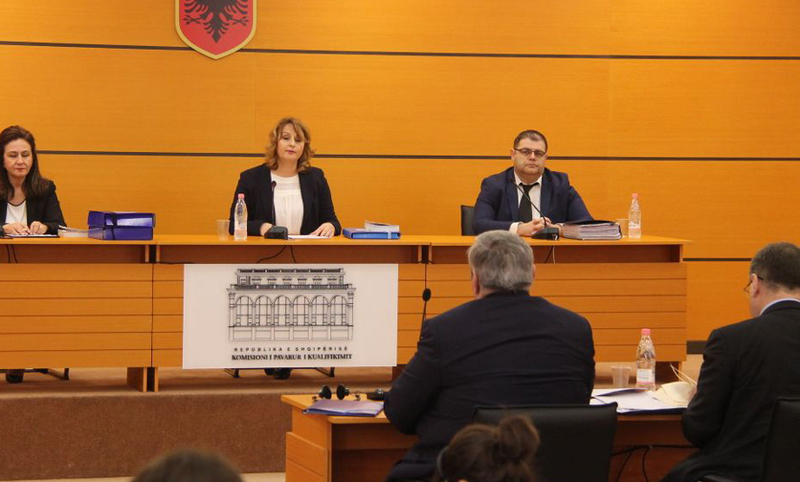 New appointees will need to have completed the School of the Magistrature, but the problem is that the KLP and KLGj not only appoint graduates, they also determine the number of positions available in the School of the Magistrature. As a result, director Sokol Sadushi recently sounded the alarm about the fact that not only will the 16 magistrates graduating this year remain without job, but that also he will not be able to accept new applications for the 25 available positions in the 2018–19 academic year. Sadushi proposes a solution in which Parliament passes a “transitory provision,” allowing the 25 students to start in the next academic year without the approval of the KLP and KLGj. However, this would then set a precedent for other “transitory provisions” of the Rama government, which holds an absolute majority in Parliament, to “fix” the justice reform while it is ongoing. For example, it could suggest a “transitory provision” to fill up the vacancies in the Constitutional Court or the High Court, as it has done with the General Prosecutor. Let us assume that such provision is passed in Parliament, and 25 students will start at the School of Magistrature later this year. By the time they are finished, they will have to fill up hundreds of vacancies throughout the judiciary system. The KLP and KLGj will only be able to mitigate this discrepancy starting with the 2019–20 academic year (assuming a best-case scenario). These new magistrates will then only be able to start work in 2021. So the unconstitutional delays with the installation of the KLP and KLGj do not only directly affect the current judiciary process in Albania, through an illegitimate General Prosecutor and crippling the courts. It will also affect, for the foreseeable future and up to the next parliamentary elections, the proper functioning of the “independent” judiciary once the vetting has ended. The damage done by the botched implementation of the judicial reform, which the EU continues to insist is “on track,” will weaken the judiciary for years to come. And a weak judiciary is only profitable to the Rama government and organized crime.